We take our responsibility to our donors seriously. We’re proud that 93 cents of every dollar we spend goes straight to programs and initiatives to drive diagnosis, treatment and find a cure for celiac disease. The Celiac Disease Foundation is a charitable organization with tax-exempt status granted under Section 501(c)(3) of the Internal Revenue Code. Our Federal ID# is 95-4310830. Donations are tax-deductible to the full extent allowed by law. The Foundation is a recognized member of Independent Charities of America (ICA), a nonprofit association of America’s best charities, and Health & Medical Research Charities of America (HMR), a nonprofit organization that pre-screens high quality national and international charities. The Foundation has received the GuideStar Exchange Platinum Seal of Transparency, a leading symbol of accountability provided by GuideStar USA, Inc., the premier source of nonprofit information. The Celiac Disease Foundation delivers its programs and services through the National Office located in Los Angeles, CA and through an international network of Team Gluten-Free members, Student Ambassadors, and Patient Advocates. Expand the research effort to drive diagnosis, treatment and find a cure for celiac disease. Translate research findings into accessible information for health professionals, people affected by celiac disease, and the public. Advocate for constructive public policies that support people with celiac disease and their families. The Celiac Disease Foundation receives donations from corporations to support its mission and programs that advance research into the causes of and cure for celiac disease, help raise awareness of celiac disease, improve the diagnosis and treatment of the disease, and support individuals and families affected by celiac disease. Corporate donations account for approximately 30% of the Foundation’s annual budget, including 3% from pharmaceutical and biopharma companies, with individual donations comprising 70%. The Foundation receives no government funding. 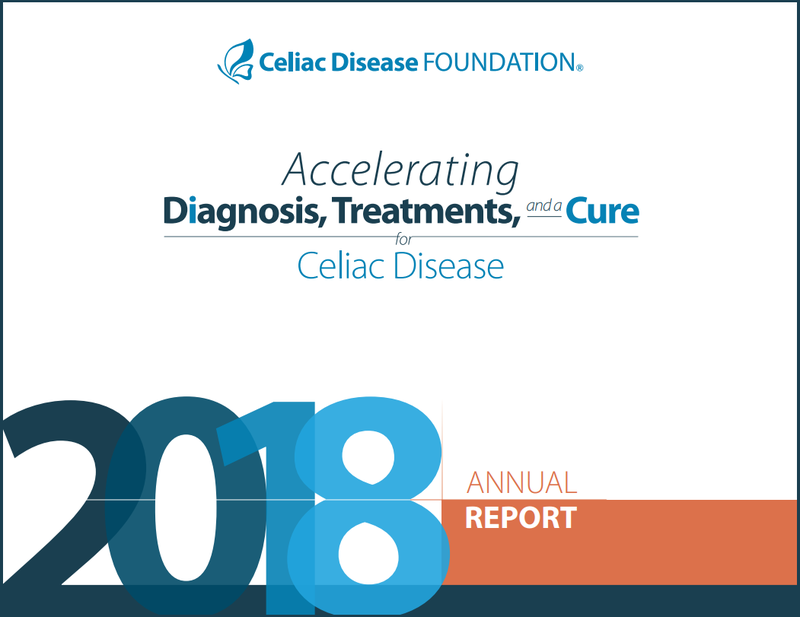 Annual Report We thank you for your support of the Celiac Disease Foundation. 2018 Year in Review View our accomplishments in past years of work.